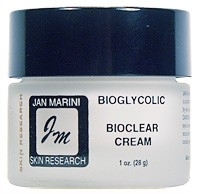 Jan marini Bioglycolic Bioclear Cream - What do you do when acne hits you as an adult? This is the time when most are thinking about anti-aging products for the skin. Well, you can now zap acne and prevent wrinkles with one product. Sound too good to be true? Not So! The Jan Marini Bioglycolic Bioclear Cream actually targets adult acne. It deals with acne scarring, inflammation, discoloration, large pores, and fine lines. Those who suffer with adult acne. Use conservativly. There is such detailed instrustions on how to use this products. Taken from SkinCareRX, "If consumer is using a glycolic acid based product, Bioclear will replace that product. We recommend starting with a once per day application. Gradually, over a week or so, increase to AM and PM application. Bioclear is applied after C-ESTA or immediately after cleansing if C-ESTA is not included in regimen. Mild stinging may be experienced initially as well as a temporary redness and flaking. Continuation of any other products in your normal skin care management system may be used in their usual order." "Makes my skin look airbrushed." "I'm 50 and I noticed a difference in my skin after 1 week of use." "Used slowly to build up tolerance, my face looks great." "This is the only product that has ever cleared up my whiteheads." "It really really makes my skin glow."